Disclosure: I was compensated for creating recipes and this post. All opinions expressed are 100% my own. The holidays are fast approaching and I’m trying to get everything organized now. One thing I like to do is have some snack foods on hand for holiday visits by friends and family. It’s always nice to have a delicious treat to serve guests whether they drop in for a planned visit or come by unexpectedly. I intend to keep a supply of STACY’S Bake Shop Bakery Crisps stocked in my pantry this holiday season. Not only are they a versatile snack, but they’re also delicious! You may already be familiar with the STACY’S brand. I’ve purchased STACY’S pita chips many times in the past and this year, STACY’S launched a new product: STACY’S Bake Shop Bakery Crisps! They are artisan bakery bread that’s first baked and then sliced thin and baked again to create the perfect crunchy snack. They come in savory and sweet varieties including Herbed Baguette, Pretzel Bread, Banana Nut and Vanilla Pound Cake. Don’t those flavors make you hungry? Yes, they are as good as they sound and it’s hard to pick which to try first! Eat them straight out of the bag on their own or pair them with a spread or dip. I had fun coming up with a few different ways to eat mine. Herbed Baguette Bakery Crisps are flavored with garlic and rosemary baked into the goodness of a crunchy baguette. Some serving ideas are to add them to a salad as a “crouton” or top with a flavored herb & garlic cream cheese spread. I made Herbed Bruschetta Bites with my bakery crisps to serve as an appetizer. I loved the fresh, juicy tomatoes on the crunchy herb flavored base. With this recipe, the bread is already made so you only have to prepare the bruschetta mixture itself. It tastes even better the next day after the mixture has been marinating in the fridge. 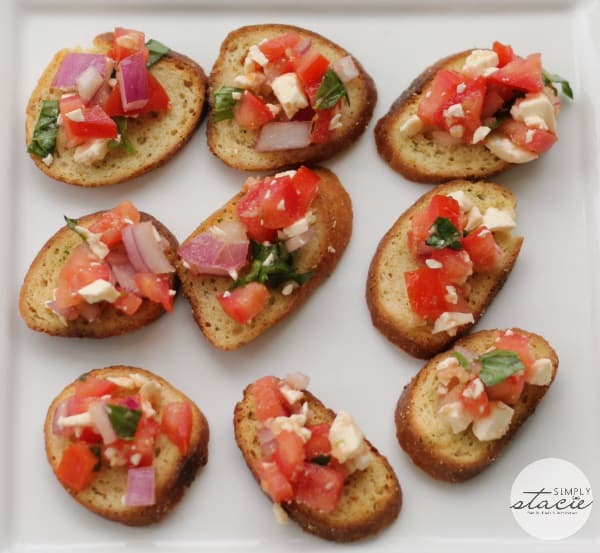 One idea is to make the bruschetta mixture ahead of time and have it in your fridge ready to serve. Then it’s only a matter of adding a spoonful on top of each bakery crisp. So delicious and easy! 1. Toss together tomatoes, garlic, basil, red onion, feta cheese. Add in olive oil and balsamic vinegar and mix. 2. 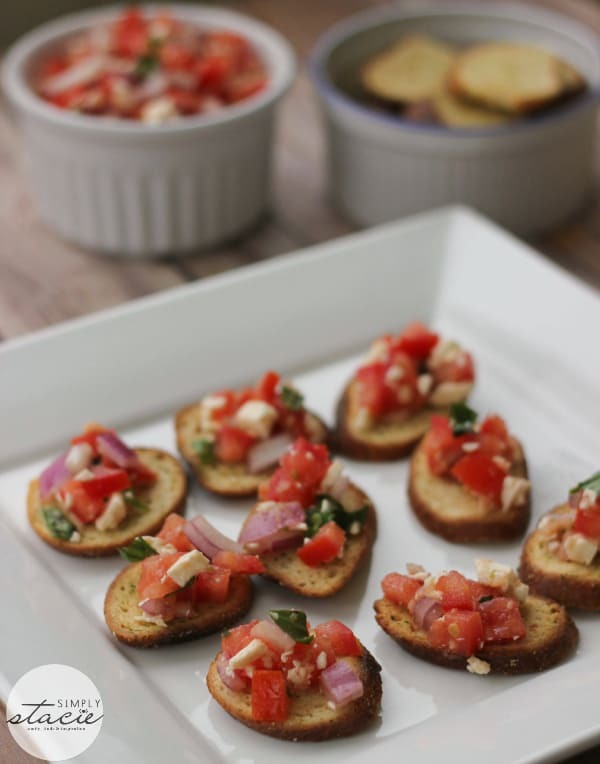 Top each bakery crisp with a spoonful of bruschetta mixture and serve. Pretzel Bread Bakery Crisps is STACY’S Bake Shop’s other savory variety. The crisps are delicious dipped in Dijon mustard or topped with cheese. You could even make your own little pretzel bread sandwich with cheese, ham and mustard for an afternoon snack. I thought they’d be tasty as a pizza, but not just any pizza….Pesto Pizza! The recipe was a hit! I used a jar of prepared pesto sauce that we had in the pantry and some leftover chicken. Then it’s just a matter of assembly adding your sauce, ingredients and topping with cheese. Pop in the oven for a few minutes and you have pizza bites. 1. Mix together onion and chicken. Set aside. 2. 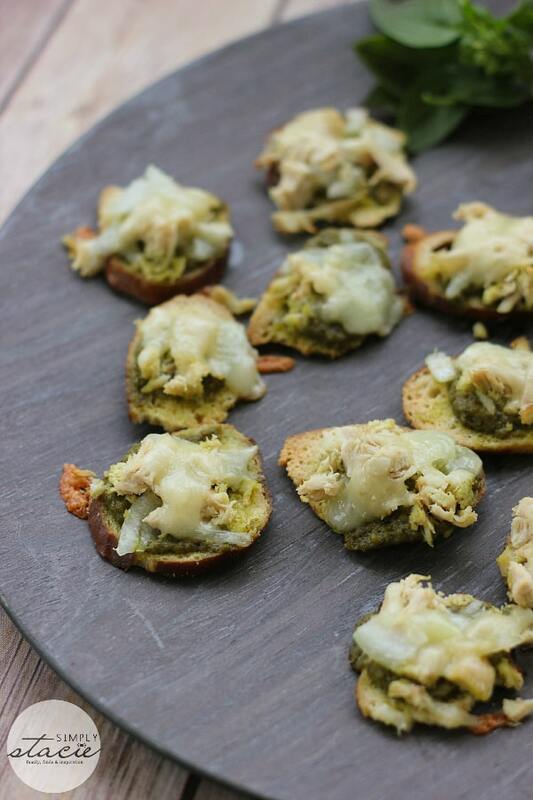 Spread pesto sauce on each bakery crisp. Top with chicken mixture. Sprinkle mozzarella cheese on top of each bakery crisp. 3. Bake in a 350°F pre-heated oven for 5 minutes, or until cheese melts. Let cool about 5 minutes and serve. Makes 20 individual servings. I love the home-baked taste of the STACY’S Bake Shop Banana Nut Bakery Crisps. It reminds me of a crunchy version of my mom’s banana bread, but with nutty pecans instead of walnuts. So good! It’s even shaped like a mini slice of bread. Add some honey, jam, nut butter or snack on it plain as is. I made some Chocolate Banana Bites for a sweet treat to eat with my morning coffee. It’s basically just chocolate hazelnut spread, a slice of banana and a sprinkle of toffee bites and white chocolate. They are simply divine and can be whipped up in less than 2 minutes. Now that is my kind of snack! 1. 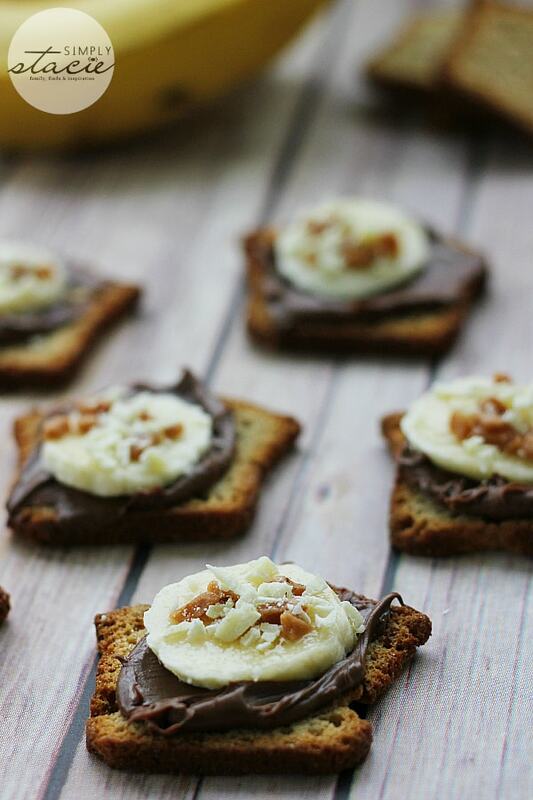 Spread chocolate hazelnut evenly over each of the bakery crisps. 2. 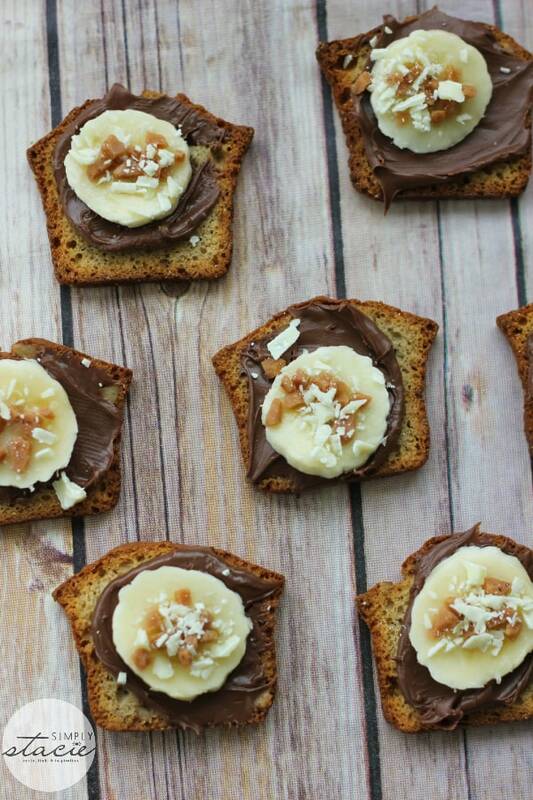 Place one slice of banana on top of the chocolate spread. 3. Sprinkle with toffee bits and shaved white chocolate. Makes 12 Chocolate Banana Bites. I saved my very favorite for last: STACY’S Bake Shop Vanilla Pound Cake Bakery Crisps. Oh my! Where have you been all my life? They taste just like a crunchy vanilla cake and reminded me a little of biscotti. I love dunking them in my coffee. You could also top them with caramel sauce, fresh fruit, whipped cream or even some yogurt. I thought they would be perfect to use as a base in a cheesecake. 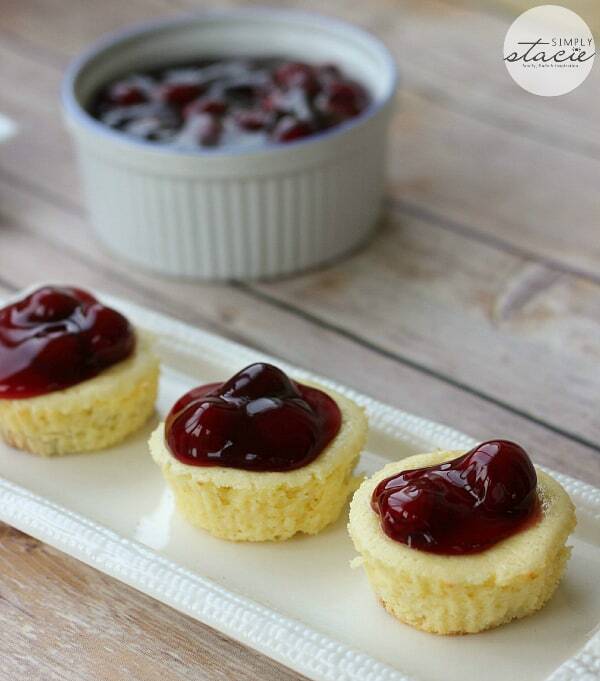 I made mini cheesecakes topped with some cranberry-cherry pie filling for a festive dessert. The bakery crisps bake right into the bottom of the cheesecake. The recipe makes about 18 mini cheesecakes. John even complimented me to tell me how much he enjoyed them. He said the cheesecake wasn’t “too rich” and he ended up sampling more than one. I did too though. They were just so good! 1. Add STACY’S Bake Shop Vanilla Pound Cake Bakery Crisps to the bottom of each muffin baking cup. You will have to break them into smaller pieces to make them fit a regular sized muffin pan. Don’t worry if it doesn’t fit together perfectly. Set muffin pan aside. 2. In a mixing bowl, beat the cream cheese, sugar, eggs, vanilla and lemon juice with an electric mixer until smooth. 3. Fill each baking cup with cream cheese mixture almost to the top. 4. Bake in an oven pre-heated to 350°F for 20 to 23 minutes or until cheesecake is set. Remove from oven and let cool for 10 minutes. 5. Place cheesecakes on a baking rack to cool for about 30 minutes. Top each cheesecake with a dollop of Cranberry-Cherry Pie Filling (or topping of your choice). Refrigerate any uneaten portions. Makes about 18 mini cheesecakes. 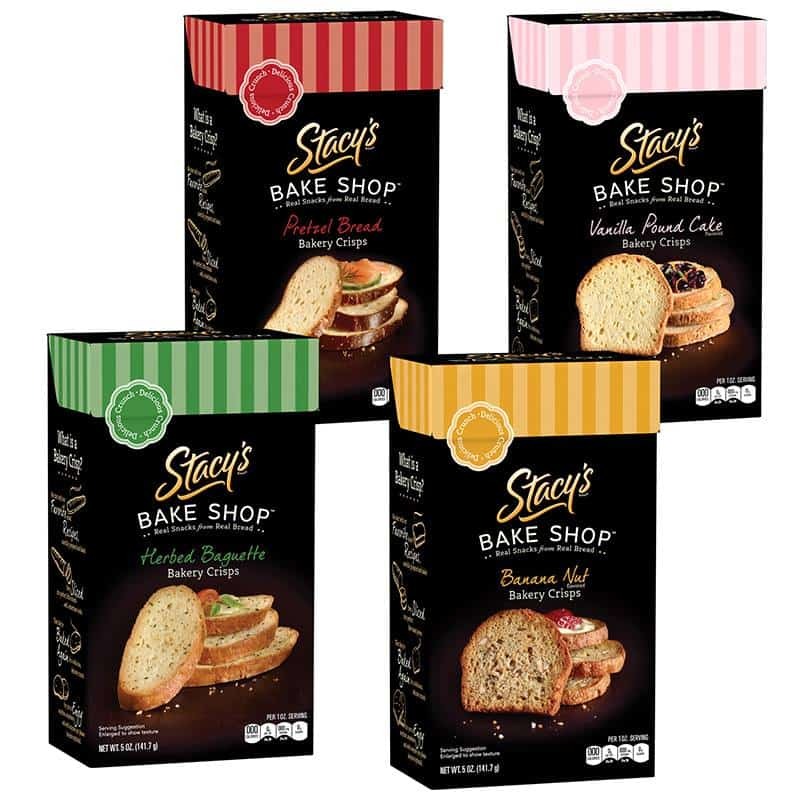 STACY’S Bake Shop Bakery Crisps are now available in retail stores nationwide. They come in 5-oz packages and have a suggested retail price of $4.29. If you want a high quality, sophisticated snack that will impress your holiday guests or just to eat and enjoy on your own, these are the snacks to buy. Which flavor do you think will be your favorite? the vanilla Pound Cake sounds the best to me. The Vanilla Pound would be my first to try, but the herb is a close second!! I would like to try the Herbed Baguette Bakery Crisps. I would like to try the STACY’S Bake Shop Banana Nut Bakery Crisps the most. Vanilla Pound Cake Bakery Crisps. Ooooh the vanilla pound cake!! I can’t wait to try the Vanilla Pound Cake flavor!!! THANKS! I would like to try Banana Nut. The Banana Nut Bakery Crisps. 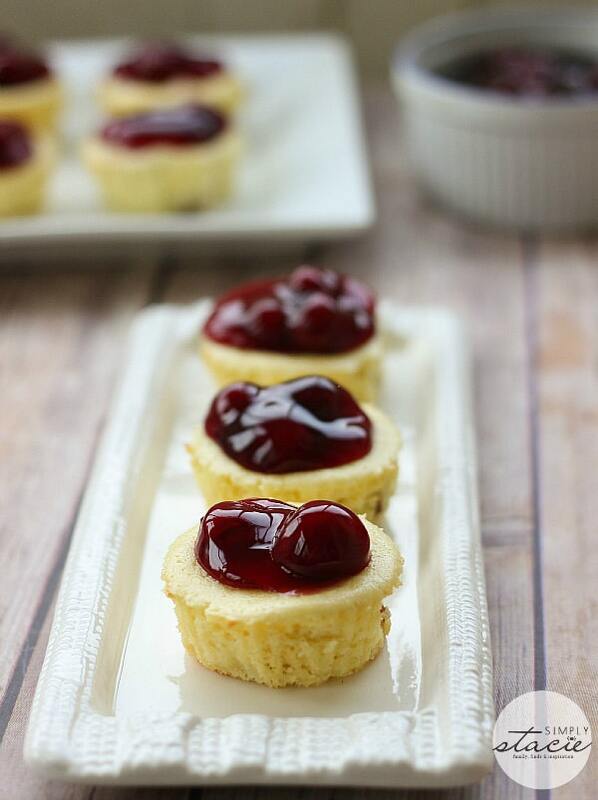 those cranberry-cherry cheesecakes sound delicious and they look so pretty! I have been unable to find stacys banana nut crisps anywhere in nj,pa,me or de. How can I obtain a case? I love these crisps & have been enjoying them every day with my tea. Thank you!